So normally I'm quite naughty when it comes to baking equipment. I usually see it, basket it and buy it. I don't really look at the price as its my biggest passion and its one of the few things I do spend money on now. However, Its the week of pay day and the baking urge hit. 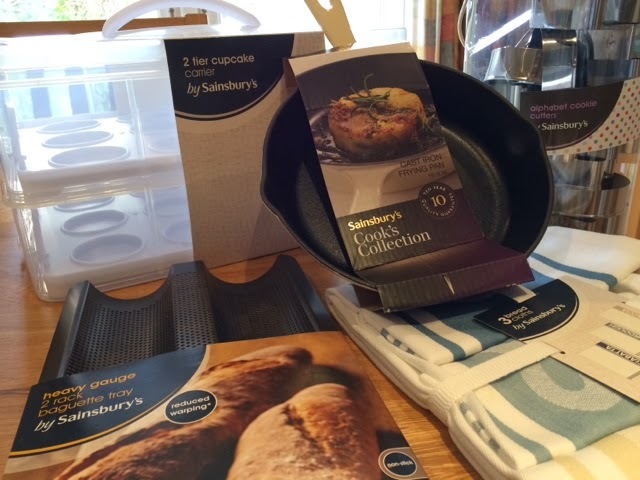 Lucky for me Sainsburys have just started an amazing Cookware offer. Lots of new lines are currently 1/3 off and although it might not sound a lot there is ALOT of new stuff that has previously been sold else where for ALOT more money. The first items into the trolley were the 2 tier cupcake carriers. Now a lot of you have asked me before where I got my old carrier from, as it fits 24 cupcakes and can be used as presentation trays. Originally I purchased my first carrier from Hobby Craft. As you can see they are currently on offer at £12.50 (sadly I paid £25 for mine). Sainsburys version is exactly the same, same height, same trays, same clip lock system. They are currently selling for £6.66! The great thing about these carriers is they stack together. So if you have 2 or 3 they will all lock together and you will no longer have to worry about juggling multiple boxes. I grabbed two and went back in for more later on but sadly they are all sold out. They are available online here and the offer is on until the 11th of March. Next in the trolley was the heavy gauge baguette tray. These are brilliant little moulds to help you prove and bake the perfect baguettes. They are currently selling at £5.33 in store or online here. Now that i've conquered my fear of bread I felt the need to invest in these bread cloths. I can't honestly say I really needed them, as any old tea towel will do...But I love filling draws with random crap and watching my Mums head explode...teehee(-towel). A pack of 3 towels set me back £5. Sadly I cant find them online. My love of pastry has also hit new levels over the last week. And i'm going to attempt to make "The Broke Boy" out of puff pastry with these Alphabet cutters. I paid £9.99 for them but the website currently says they are still £15 here. Might be worth keeping an eye on them if you are interested. And finally my diddy little frying pan. The website again says that this is £20 but I got it in store this morning for £13.33. For those of us that don't have the money to purchase the lovely Le Cruset collection of cookware this to me is the next best thing and its incredibly good value for money. Its just as heavy as the real thing and just as long lasting. I have quite a few pieces of the Sainsburys collection and got this little frying pan for creating mini Tart Tatins. You can find it online here and the rest of the collection here. All in all some great offers. They have a lot more stuff in store to so I suggest you have a look! Also keep checking back as I will hopefully be putting together a give away in the next week or so!